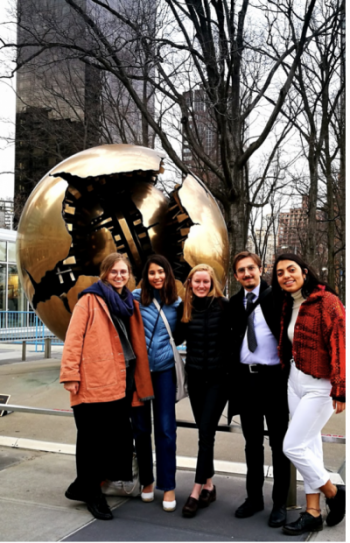 Right now there is an exceedingly long break in the action, so I thought I would take this time to give a look at what a day-in-the-life of a youth delegate at COP13 is like. 7:30 – Grab breakfast knowing it will probably be the last time I eat until dinner. 8:30 – Run to the opposite end of the convention center because for some reason the two main conference buildings are really far apart. 10:00 – Meet and strategize with other youth regarding specific activities for the day. 10:30 – Work as a group to track down good quotes for the press release, finalize it, and send it to media contacts. 11:00 – Go to the “bunker,” a space designated as the youth command center (underneath a stairwell), to help with current tasks. 12:00 – Distribute green ribbons for people to tie around their arms as a show of solidarity with the youth movement and the need for strong action on climate change. 12:30 – Realize the banner for the days action still needs to be finished and that the press release still needs to be printed (the action is at 1, in 30 minutes). Finish both in the nick-of-time. International youth are amazing working together under pressure at this point. 1:00 – The youth statement at the high-level plenary hasn’t been given yet. Aaagghhh. This is what we have all been waiting for! But we need to do our action! Well, the speech is way more important, we can just do the action late. 1:15 – The speech is amazing. Almost everybody is moved to tears in the high-level plenary session at COP13. The energy in the room is incredible. Nobody is able to fully articulate what happened beyond simply saying it was unbelievably incredible. Thinking about it still makes the hairs on the back of my neck stand up. This is our future and we demand action. If the wrong decisions are made, we won’t have time to go back and fix them. 1:25 – Rally tearful people around the activity, but realize we are now way past time and Avaaz.org is about to have their huge event – the presentation of roughly 2 million signatures calling for strong climate action. 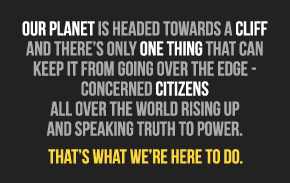 We’ve been working with Avaaz for the past 2 weeks and being the awesome people they are, we decide to combine actions. We hold our sign that simply says “Please” as the petitions are presented. 2:00 – Decompress from the morning’s activities on the way to a Climate Action Network (CAN) strategy meeting on the other side of the conference center. Get updated on the current state of play. 4:00 – Rush back to the main conference center to make it in time for the US Press Conference, only to find out it isn’t taking place. 4:30 – Meet with the SustainUS delegation for a last formal debrief of the past 2 weeks. Get all warm and fuzzy inside. 5:30 – Head over to “Fossil of the Day,” a daily award given by CAN to the countries most climate-unfriendly the previous day. Usually the US is up there. This time around we had a stand-off with Canada for “Fossil of the Year” where US and Canadian youth performed a song/dance to the tune of “anything you can do, I can do better” to see who would get it. In the end, Canada and the US decided to share first place, admitting we were equally destructive in the negotiating process. 6:30 – After fossil, a conga-line started up which snaked out of the conference center. Once we get outside we perform “oooooo, it’s hot in here,” the unofficially official youth climate song and dance. 7:00 – Head to the last International Youth debrief where we discuss next steps and actions for the year to build on the momentum started here in hopes of creating a sustained global youth climate movement. Get all warm and fuzzy inside again. 8:30 – Go and get food! Take about an hour to relax and reflect on the day. What a crazy day it has been. 9:30pm – Return to the plenary where the negotiations are supposed to begin again. 2:00am – Realize I fell asleep on the floor a few hours ago and that the negotiations still haven’t started. 3:00am – Return to the Hotel after learning the talks will resume at 8am. 6:30am – Wake up after learning that the Canadians who slept at the conference center need back-up. It’s time to take action. 7:30 – Rush to the conference center and plan what we are going to do. Make some quick banners and head to the entrance. A sign that says “Please” (since we couldn’t find the one used the day before) surrounded by US flags and a banner the Canadians made that simple stated “This will follow you home” with a background of the Canadian flag. Got a bit of media coverage, but we were there for the official delegates. We were there to let them know we are watching and waiting. 8:30 – Return to the plenary room and the negotiations get going again! 9:15 – The session is adjourned due to contentious language in the text. What’s supposed to by a 20 minute break to determine positions on the issue turns into 2 hours. 11:15am – The session resumes, but is quickly closed again when great concern is brought up over the fact that the requested ministerial meetings are happening at the same time, which means discussion can’t go forward until they are finished. This is going to be a long day. Present – And that’s where I am now. I hope this gives a better idea of what 30 hours at the COP might entail. What’s amazing is that everybody else here was equally or even more busy. The youth here are incredibly inspiring and intensely dedicated. We are doing everything we can to pressure our leaders and ensure a safe and just future for all.